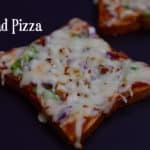 If you are craving for pizza and don’t have time to prepare the dough and let it rise this is best solution. Easy, quick and delicious. It takes no more than 10 or 15 minutes, you can choose your favorite pizza toppings and is done, ready to be served. Apply some butter on the tawa and then toast bread on one side only till golden and crisp. Place the toasted bread side up and spread pizza sauce. Sprinkle some onion,tomato,bell pepper,Mozzarella cheese,pizza seasoning and chilli flakes. 1. You can use any vegetables of your choice like corn,olives,jalapenos. 2. Cook on low flame else bread base may get burnt.